Hey there friends. I'm a music lover. Can't get enough of the stuff. So when Guitar Hero first came out, I thought it was great. You're simulating playing a guitar and it does a pretty damn good job at having you strum when you're supposed to. But that's not the point of this post. I'm here to write about the effect that the music in Rockband and Guitar Hero has had on my kids. Nothing beats hearing your three year old walking down the hall singing, "Slow ride, dun dun, take it easy, dun dun, slow ride". lmao How great is that? My wife even has her as a ring tone. I don't want to instill my, or our style for that matter, of music into the kids. They listen to what they like and we let it be. Case in point, The Offspring's latest single... I can't stand the damn song. They play it over and over but the kids love it. So I let it play so that they can enjoy it. Anyways, I love the music selection in both of these games. It exposes the kids to wide array of music. The Donnas, Metallica, Pantera, Jimi Hendrix, KISS, Guns N Roses, Queens of the Stone Age, Slayer, Soundgarden... The list goes on and on... And the kids ask for their favorites to be played. "I want to hear Black Hole Sun. ", "Oh that's Black Magic Woman! Leave it there", "I love One!" These are just some of the phrases that I hear at home or in the car. Just last night, my daughter walks up to me says, "My friend at school can play Jordan on Expert and get 5 stars!!!!" Of course my son and her start debating about her friend being a liar cause Jordan is a pretty hard song to play. She then mentioned Buckethead. 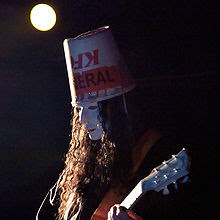 Buckethead. I haven't seen that guy since forever and look what resurfaced him. My kids arguing over a game. He's been around since like the late 80's and for my kids to be mentioning Buckethead, and saying that he's cool, astounds me. This is music before their time. Santana, Buckethead, Iron Maiden, Ozzy, Queen, these are all great artists that my kids would not be exposed to as much as they are because of the music on these games. Yeah, they would hear Iron Maiden when I played it, but they wouldn't know who it is or the name of the song. They would know of Iron Maiden as "a band my dad likes". Now, Number of the Beast is one their favorite songs. Because of that, they venture off to listen to the rest of the album and enjoy other songs that otherwise they would not be interested in. I can now say that my kids are Iron Maiden fans, as well as Metallica fans, and Santana fans and Buckethead fans. I love it. Anything that will expose music to the youths of our nation is great. And even though the games are a challenge to complete, the bright spots are definitely in the music. Just for the hell of it, because I'm feeling a little nostalgic here, here's Buckethead's Jordan as it's played in Guitar Hero II. I chose this version because even the mighty Buckethead created a solo just for this song. From what I hear, it's the only studio version of the song. You only hear live versions of this song so for him to do a studio version for a game says something. So without further delay... Here's Jordan. By the way, this is not an actual person playing the game. He's got a computer trying to do it cause it's so damn hard. lmao Later! HAHA! My sentiments exactly! IT's really classic when my two year old blabbers the tune to "Crazy Train" by Ozzy Osbourne when he wants to watch a train video about his favorite CSX trains. Classic! 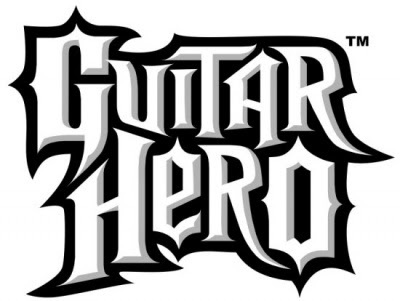 I credit Guitar Hero for igniting my kids' passion for Classic rock. All 3 of my older kids like it now. And 80s rock, too. It's created areas of rapport we lacked, and needed. Guitar Hero Rocks! And, so do my kids! My son actually plays a REAL electric guitar, and is using the music talent he was wasting while trying to avoid piano lessons! WOW!